I first came across Makiko on Instagram about a year ago. I instantly liked her beautiful tableware, and I also loved that her content is in two languages (English and Japanese) too. In an interview I found out how she became a potter, what techniques she uses for her pieces and what benefits she sees in running her own business. My name is Makiko Hastings. 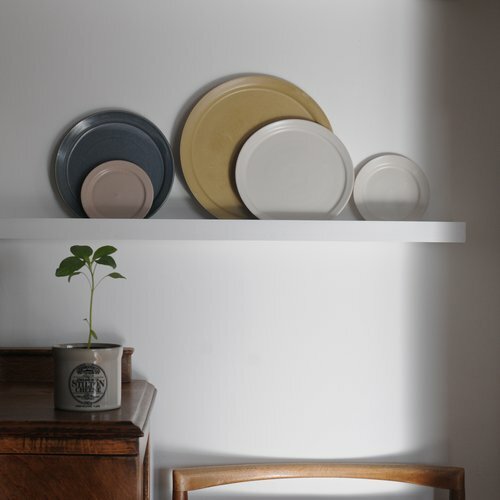 I’m a potter and I make mainly hand-thrown tableware. I’m from Japan and live in North Yorkshire, UK with my husband and five year old daughter. When did you decide to start a career in pottery and why? I think it was during my teaching time from 2009 onward. I first studied ceramics back in 1999 but after that, I went for a totally different career as a social care worker for people with special needs. I worked within the social care industry for 17 years. Although I had worked as an occasional assistant for a studio potter (my late mentor David White) on my days off and had been in the pottery studio environment on and off for a while, I never thought I’d become a potter myself, mainly because I thought I would not be able to support myself financially. Then in 2009, an opportunity opened at the local art centre for people with special needs, they were looking for a new pottery workshop teacher! I applied for the job and got a place. By running a pottery workshop every day, I became more and more passionate about clay and really enjoyed helping others to learn new skills. I realised that I wanted to make my own work too - not just teach, so I enrolled for a BA course that I could complete whilst working. My husband and I built a studio in our garden and bought a kiln. After graduation in 2012, I started my business part-time, slowly making things once a week and selling my work through the shows etc. Our daughter was born a year later and I had to close the studio for three years due to her medical needs. Fortunately she is doing well now and last year she started school, so I just knew this is the time, now or never! (also, the hours were not suitable for school holidays) so I quit my teaching job to become a full-time potter. Quite scary really. Where do you create your work and what techniques do you use? In my tiny studio in our garden, which was a combined old garden shed and empty space behind the garage. My husband constructed it and we built the space little by little together. I mainly work on the wheel but also hand build some pieces. My tableware is all stoneware clay and fired with my hand-made glaze. 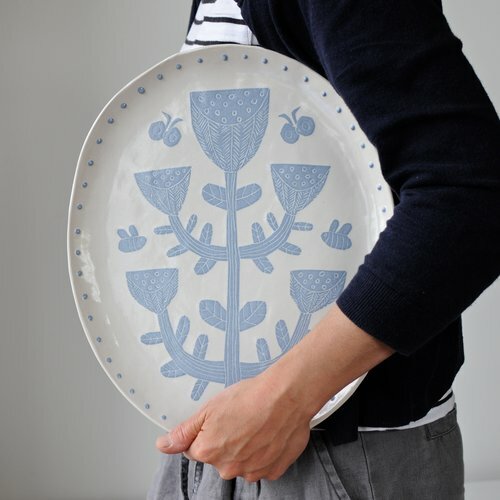 For one of my collections, I use slip and sgraffito decoration, which is blue and white. Of all the things you've created, what is your favourite piece and why? It's not actually the work but rather a personal object, which is a piece of hand thrown porcelain platter with my daughter’s foot print on. I just love it so much and it’s on our mantle piece so we can see it every day. Clay does shrink, especially if it is porcelain, so the foot print is not the exact size, but it was not about the accurate size but the memory that I wanted to keep. When my girl turned one year old, I threw a plate and got my husband to carry her whilst I was pushing her wiggly feet against the surface of wet clay! Then I stamped her name and DAY365. I made two pieces, one for us to keep, the other one for her. You became self-employed last year. What advantages have you seen in running your own creative business, and what have you found challenging? Being my own boss is certainly an advantage! I had worked for an organisation for a long time, and there were times where I felt I was going nowhere (because of the management system). I like the fact that I don’t have to bang my head against a wall anymore for such reasons. Of course there are difficult times being self-employed and you have to work hard. But having control over how I work is great. Another good thing is flexibility. Whilst before I had to juggle a lot to take time off work, but now I can organise my time without much restriction, so that I can arrange to come and see my daughter’s show at school etc. and sometime I can take a day off to go to ceramic events, which I did a couple of times this year and it was great! Lack of time is the most challenging part for me. At the moment, my girl is in her first year at school, so she still needs me quite a lot. So I can only work during her school hours and when my husband is available to look after her in the eveving or on the weekend. I never have enough time for the making process, but I guess lack of time is everyone’s challenge. Pottery is time consuming, and you need to get work done at the right condition of clay, so balancing timing within your limited time is hard. I go to the studio at 9am straight after the school run and then work up until 3pm. Depending on the task of the day, I may be throwing, turning or glazing etc, or doing several tasks in a day. Every morning I start with my studio diary, in which I write down a rough planfor the day ahead. As my studio is in my garden, I pop back to my house to have a quick lunch. At this point, I often pop out to my garden for five minutes or so, to breathe and refresh my mind. I sometimes work on evenings and weekends, depending on the work load and tasks left from the day. In what way do you think creativity or working in a creative field can influence someone's happiness? When I was running the pottery workshop for people with special needs, I always focused on the ability rather than disability of individuals. no matter how small it was. By creating something or being in that environment gave them a chance to explore, express and try something new. It gives them a sense of achievement. I think everyone is happier when you feel that way and I truly believe that creativity can empower people. Heiter is a bilingual platform (English and German) and so are your blog and social media channels (English and Japanese). What benefits do you see in offering your content in two languages? It has certainly helped to widen my audience. But that was not really the reason I used both languages. Although I live in UK, I don’t want to lose my sense of being Japanese. When I first started my blog, it was just in English but later on I added a Japanese version simply for my mum to be able to read what I was writing. I continued doing it and gradually my audience in Japan grew. I found it really nice to be able to communicate in my own native language. So I did the same on my social media channels and now it has become a habit. I think writing in your own language is important, not just for Japanese readers but for me to express myself. Of course nuances, words and or phrases don't always carry over. I have this thing both in English and Japanese, that is why my posts are never literal translations. But that works for each reader if you know what I mean. By writing in the language in a way that works better, I think you can make what you would like to say more articulate. Google translate would never be able to do that! How would you describe a perfect heiter (cheerful) moment? Having a cuppa in your favourite cup! Simple, cheerful and happy!